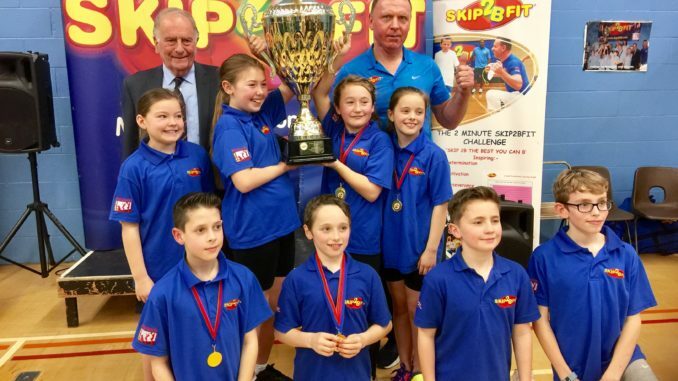 The 14th annual Skip2bfit Thanet Primary Schools Skipping Challenge Day title has been scooped by defending champions St Peter’s Junior School. The contest was held at Ramsgate Leisure Centre on Friday (March 3). It was supported by Tesco, Winterwood Farms, Your Leisure and every primary school in Thanet was invited to attend. There were 31 teams attending with 4 girls and 4 boys in each team. Prizes are awarded for the top teams in junior and infant categories. This year the event was also attended by Sir Roger Gale MP who came along to see the work being done in Thanet to support children being active and eating healthily. The Best Effort Cup went to Ellington Infant School. Skip2bfit creator John McCormack said: “Skip2bfit would like to thank all the schools who made the effort to bring their children along to this event. The top parent award went to St Joseph’s (294 skips) and the best effort overall school was Chartfield.